OnDeck Capital Review is a business that provides small business loands to small businesses in need of funding for a variety of reasons. OnDeck differentiates itself from other companies that give small business loans because their mission statement is based around providing loans to small businesses at a speedier pace than other companies conducting similar business. Another essential characteristic at the core of the OnDeck business model is the flexibility in the financing options they offer which centers around ‘Term Loans’ up to $500,0000 with rates as low as 9.99% and Lines of Credit offered o $100,000 with APR rates offered at a minimum of a 13.99% rate. If you provide a business tax ID, Social Security number, driver’s licens number, 1-3 months of bank statements and three months of credit card statemens, with your business in a pinch, you could receive a loan within an hour and a response with the approved funds within 24 hours. The variety of offerings with term loands and lower interest rates balanced against lines of credit up to one hundred thousand dollars and rates beginning at 13.99% may incentiveze some small business owners, but are important to evaluate the reasoning for why the APR rate is above 8% unlike some other companies that provide loans to small businesses. It is important to evaluate what is right for your given business. OnDeck’s business platform is based larley online and their user interface has improved since their inception in 2007 because they have hired developers to help them adapt to the time as technology has and continues to change the lending business. Small business owners are no longer walking into any bank on the street, but they are faced with a slew of options when trying to retreieve small business loans. While underwriters are usually still an integral part of the small business, OnDeck has taken on a different approach by offering a variety of short term loans and lines of credit to small business qualified owners (this means small business owners with a credit score between 500 and 600 can receive a loan in 24 hours). Most of their borrowers to have a score closer to the median range of 600-700 with gross revenue nearing half of a million dollars for most of its clients at $450,00 and most businesses usually do not repay their loands for almost 7 years. The business model is acutally commendable based on the A+ rating with the Better Business Bureau and the deliverable of dollars at over six billion dollars for global clients. These are incentives to utilize OnDeck’s services for investment and business development purposes. It is important to take the businesses’ opaque nature of conducting business into consideration here. Their sales approach has been considered fishy or to have a lot of red ink that most people, or the average small business owner does not focus on so it s important that when considering your options, you decide to evaluate everything listed within your contract with the OnDeck business loans force. OnDeck prides itself on being able to assist businesses in a bind that a bank may not consider lending to because their credit score is not at 720. The working capital loans and business expansion loans are critical attributes to OnDeck’s small business lending platform. Thie A+ rating by the BBB, $6 Billion plus they loan to small businesses globally and 9.5/10 rating on TrustPilot proves that Ondeck is a legitimate player in the online small business loan landscape.Their working capital and business expansion loands are rooted in solving problems for Main Street busiensses using state-of-the-art technology and algorithms to assess the performance levels of small businesses applying for loands allowing them to have a better understanding of the likeliness they will be repaid of the loan by the small business owners, even if their credit score is not as amazing as another small business owner. 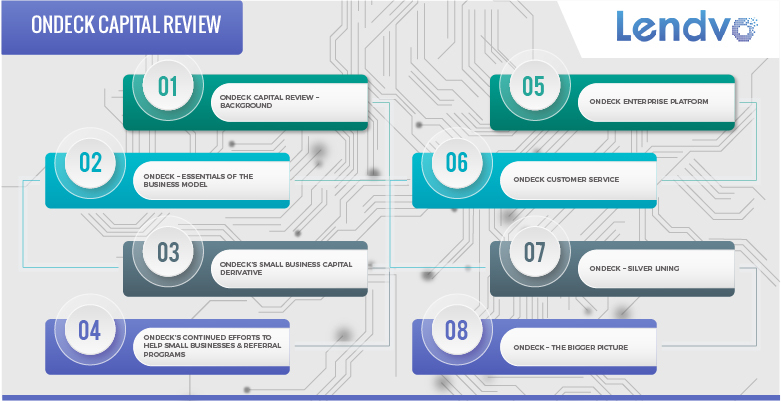 The credit engine uses a fifth generation proprietary credit scoring model with over 100 external data sources, 10 million small bsuness existing in the proprietary database at 2,000+ data points per prospect. This is then combined with the accounting, credit, transactional, propertiery information and public records of the company to generate the OnDeck score. Partners have included TSYS, BBVA Compass, CardConnect and more. The Product expansion program works directly with Ingie’s List implemended marketing solutions so clients can directly access OnDeck financial catering to a unique relationship for all Angie’s List customers, allowing them to receive financing on the cross-marketing platform. Of all of the businesses providing small loans online, OnDeck is actually responsible for being the largest lender to small businesses of all of the platforms. The variety of small businesses they give loans to is also the largest, ranging from hiring to general corporate purposes, acquisition, equipment, inventory purchase and more. OnDeck loans to small businesses in more than 700 industries with term loans or lines of credit to help ‘Main Street’ type businesses further their growth. More than 50,000 small businesses have gone with OnDeck for their loans. OnDeck also offers sales professionals referring merchanges and accountaints commissions in a fast and easy format when they provide referrals. When you begin on the website under the referral section, an account manager from OnDeck’s referral team will work with you through seamless technology to pair your client with the right loan program and provide the referred a commission. The Ondeck Bill of Rights is inclusive to the business referral program and enterprise platform and this causes Ondeck to conduct its business causing some confusion to potential and current clients. Some have reviewed the company as building the Bill of Rights to rope in clients. A bit different from OnDeck’s referral program is its unique Enterprise Platform which allows OnDeck to utilize its extraordinary technology so its data works with the customers of a given company to attempt to generate business with unique marketing opportunities that the algorithms of its technology help partners within the platform to find no matter what the exact business is. The Enterprise Platform is three-fold and begins with Referral marketing w hich is the integration of branded email and direct mail with in-product digital marketing; this exists within an exclusive Partner Portal for those involved in the OnDeck Enterprise Platform; their technology then uses CRM integration and API solutions to create custome solutions and within its OnDeck Marketplace and portfoloi investment platform. This includes, but isn’t limited to joint ventures, syndication and white label solutions. OnDeck’s Enterprise platform has actually been an instrumental part of its integration into the New York Stock Exchange (NYSE) as a publicly traded stock with the listing of ONDK. OnDeck business loans and credit lines have developed with the platform to offer a product known as the “Lending by Wave” platform which is available to Wave Customers in both Canada and the United States. The program allowed Wave to assimilate itselft to the entire OnDeck platform and for OnDeck’s customers to utilize both OnDeck and the Wave space simultaneously to further increase their business growth and productivity. Some clients have said it increased their cash flow and product value alloing for capital to increase and therefore entire valuations of their company to be higher than the prior amount while others have said it to be less than phenomenal. Wave was created in 2010 and is a financial platform that combines software and financial services for businesses with over 2 million clients. OnDeck is noted in the industry for having extraordinary customer service. The customer service team is available to small business owners who work with OnDeck. Advisors to specific small business owners pride themselves on being available all the time by phone or email for their clients. Merchants are given an individual account manager to deal with their customer service as needed. They respond at a quick and mannerly rate to any client questions or inquiries. OnDeck trains its employees so they are able to answer any and all questions that come their way no matter what kind of business you have. The investor relations contact for OnDeck can be reached via email at [email protected] and the contact is Kathryn Miller who is the Director of Investor Relations at 1400 Braodway, New York, NY 10018 with a phone number of (303) 630-9906. Service is available on weekends as well and OnDeck’s customer service team prides itself on being knowledgeable, efficient and steadfast. New loan assistance can be reached at [email protected] and by the phone number of (888) 269-4246. Help with existing loans is available Monday to Friday from 8 AM until 9 PM eastern time with hours also available on Saturday from 9 AM until 5 PM eastern time with an email of [email protected] Their mobile application is available at the App store for apple users and the Google play store for non-apple users. The Enterprise Platform and Referral program can be reached at (888) 556-3483 at an email of [email protected] with the website available as partners.ondeck.com for current and prospective partners. The reliable customer service has made OnDeck one of the most reputable companies in the business to provide loans for small businesses. As small businesses face issues from cash flow, employee retention to business growth daily, it is imperative to have customer service available regularly, via email and telephone. The chat option as an application on their website has actually become one of their most used options for small business owners searching for answers fast because this allows them to email, speak on the phone and browse the web while they converse with a customer service associate at OnDeck who can provide them with the answers to their problems. A lot of critics have come down on OnDeck for murky marketing and sales tactics. Some of them have said they are not clear to the small businesses they give small business loans to about their repayment policies. The term loans that OnDeck gives out requires repayments and if your small business is not able to stay afloat in the first place, then it may be difficult to make the repayments that are required weekly by lines of credit. It is required that term loans must be paid back by businesses on a daily or weekly basis. Since they are the largest in the industry, the fees can be seen as outweighed by the convenience of the small business loans since OnDeck supports so many merchants. Loans are giving from anywhere ranging between $5,000 and $500,000 with origination fees of 2.5% to 4%. APR rates begin at 6%, but a silver lining is that they have clauses allowing OnDeck’s small business loans to go up as high as 99%. The repayment on the term loans runs on a factor rate ranging from x1.003-x1.004 per month. Those involved in the small business world never forget that OnDeck never signed a bill that most small businesses sign without batting an eye. They never signed a bill called the Small Business Borrower’s Bill of Rights. Yet they are a part of a new agency called ILPA that was creating to serve as a code of conduct for small business owners based in the technology space. The 9.5 raiting out of 10 is certainly a commendable marking within the trustforce of the business world and this should be considered in tandem with decisions being made instantly with no obligation. The fact that they are making decisions within six minutes and others within twenty four hours should be taken into account when you, or any small business owner, is considering taking a loan from OnDeck and the same goes for any small business lending platform like OnDeck, publicly traded or not. At the end of the day, On Deck shares some truths and dishonesties within the financial industry as some of their practices have been acknowledged as not completely truthful while many of them have been assessed as successful, fruitful and helpful for many small businesses looking to grow their companies with employees, strategically and both. Borrowing amounts range from $15,000 to $100,000 with terms offered at the length of a reasonable six month time period. The maintenance fee is generally about twenty dollars per month but the questionable part of the business model is the APR or Annual Percentage Rate that OnDeck charges which is what we are focusing on here because not only do business owners get a smack in the back with APR, but homeowners do with mortgages and so forth. It is the ghost in the room that comes to bite business owners in the back when they are not looking to pay a fee. If you take out a six month loan, the APR rate can come back to get you after six months, even more after a year and after three years the loan rates will and could bury your business. At the end of the day, there are options like personal financing, friends and family, angel investors and banks. The slew of financial options to further your business growth and capital within whatever your industry is there. OnDeck is a viable resource with its stellar Better Business Bureau rating, ability to fund over six billion dollars to a large amount of small businesses around the word and its high rating on TrustPilot, which is always a barometer to be considered whether you are taking a small business loan or evalutiating a company to use for resources or to make one of your clients as a small bsuiness owner. That being said, there are many red flags in the water when it comes to OnDeck’s business level, including, but no tlimited to its customer reviews, some of which have said that they have been destroyed by the APR rate that OnDeck charges to small business owners no matter the size of the business. It is true that at certatin amounts depending on the line or credit amount being loaned that OnDeck is giving 11% could help a business enough to make this dollar amount back in one, three or five years. The technology aspect of the business model is enough to drive a lot of small businesses to the website via SEO because their programmers have devised an algorithm that makes getting loans from OnDeck, also known as OnDeck Marketplace and On Deck Capital Inc.. A large factor in this is the fact that OnDeck has well over 60,000 custoemrs that are in 700 different countries. The fact that a business can have so many clients and operate internationally while making decisions within 24 hours does not necessarily mean you should use them for your small business but that you should at least consider them as a viable option.